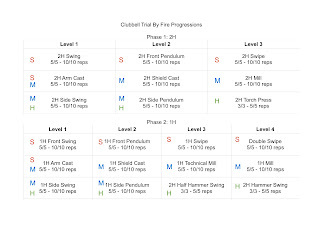 Trial By Fire (TBF) is a test for Circular Strength Training Instructors. Minimum 15lb for men and 10lb for women. The exercises can be done in any order but each exercise must be completed before going to the next exercise. The Swipe is a combination movement of the Front Pendulum and Arm Cast. The Mill is a combination movement of the Side Pendulum and Shield Cast. The Hammer Swing is simply a Side Circle. You can view it as a combination of Side Pendulum and Torch Press. Performing the movements of the TBF with a light enough weights and for a few reps of practice is very doable for most clients. However i face these two problems when getting clients to do many reps in work sets. The first is consistency. Technique deteriorate easily. The second is progression. Going up to a heavier weight is hard, even for the best clients. Men could usually do 10lb, but moving up to 15lb is hard. I myself face this problem. A few years ago, though i could go up the weights from 15lb to 20lb and can perform the movements properly, my elbows would get very sore from doing high reps of 1H Mills with 20lb. I did not practice each component separately, but just did the test movements for practice. To go up to 25lb without specific practice of the components is unthinkable. Now that i have gone through many programs in CST, it's time for me to break it down into components and be strong in each one to move up the weights. The goal of these progressions is simple: to move up the weights for the TBF movements. 1. Double Cast is the bottleneck of the movement. You can only Double Swipe as heavy as you can Double Cast. 2. Lower body strength is usually sufficient for Double Swipe at any beginner's weight (men's 10lb, women's 5lb). 1. Shield Cast is the bottleneck of the movement. You can only Mill as heavy as you can Shield Cast. 1. Technique is easier than the Double Swipe and 1H Mill. 2. Bottleneck is core fatigue. 3. Lower body strength is usually sufficient for Double Swipe at any beginner's weight (men's 10lb, women's 5lb). In a CST Instructor Cert conducted by ex-Faculty Coach Ryan Hurst, we were given a sample progression to practice the components on separate days. According to him, these were found in the CST Prep Course (now unavailable). These progressions are great in teaching a person quickly the TBF movements with a weight you already can handle. But i find that these progressions are rather inefficient as you only train for one movement each workout. Whereas i am looking for a progression that trains all movements in every workout to maximize the utility of every workout. I have many clients who travel often and i have to make sure that each workout is well balanced with all the components of each movement. This progressions is designed for them. You could do all movements in one workout but that would be much work on the Casts. And there would be much redundancy as you would practice two variations of Casts and two variations of Side Swings at the same time. These variations could be arranged in two different levels (see below). I do not know of any other published progressions for the TBF. If anybody knows of any, please let me know by posting a comment. Take note that this is not the only way, it is just one way which i have found to be working for me and my clients. 20 minutes as many rounds as possible (AMRAP). Work from 5/5 reps per set to 10/10 reps per set. Every workout increase ONE REP per set. Once you can do 10/10, move up to the next level. Exceptions would be the Torch Press, Half Hammer Swing and Hammer Swing. Halve the reps of the other movements for these exercises, ie instead of 5/5 - 10/10 do 3/3 - 5/5. Men should start with 20-25lb for 2H and 10-15lb for 1H. However i would recommend starting at 25lb and 15lb respectively. Women should start with 15lb for 2H and 10lb for 1H. Do not start with 10lb for 2H or 5lb for 1H as it has proven too light for most women. If you can go heavier, please go ahead as that is the intention of this program. You can start at either Phase 1 or Phase 2 but i would recommend to start with Phase 1 to build a higher level of overall strength from the start. Regardless of any level you do, a heavier weight would be more beneficial for overall strength. Every level would give you balanced strength development as components of all three exercises of the TBF are trained simultaneously. Even when you are just starting at level 1, you can get very strong and balanced. If you so prefer to, you could just do only Phase 1and you can get very strong just doing it. Imagine 2H Front Swing, 2H Arm Cast, 2H Side Swing with 45lb. As you progress from Phase 1 to Phase 2, you have to go lighter one or two weights anyway, so start as heavy as you can at Phase 1. 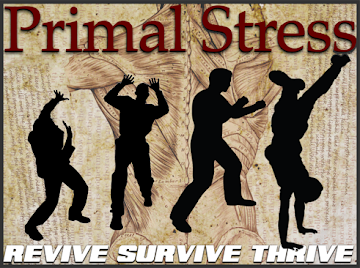 Going as heavy as you can while practicing new movements is taxing on the nervous system and your grip. I get comments every time that it is tough and every 1 rep increment is hard. So after every level (ie 6 workouts), take a month or so break and start the next cycle thereafter. 1. Beginners usually can do 2H movements fairly easily. 1H not so, especially when the heavy end is up. 2. The focus is progressing the movements, ie practice skills, not high intensity. Therefore it is good to keep fatigue in check, especially upper body strength is the limiting factor. ---> Low number of repetitions per set. 1. Casts are the weakest exercise, regardless of the variation. The Shield Cast is the bottleneck, whether 2H or 1H. Swings and Pendulums are usually fairly easily taught and done. ---> Focus on progressing the Casts rather than the Swings/Pendulums. 2. 2H Shield Cast can be very strong but 1H Arm Cast can be very weak. ---> It makes better utility of a client's training time to progress 2H Casts than 1H Casts initially. The heavier weight would better activate your lower body and build overall strength and mass analogous to working with Barbells vs Dumbbells (2H = Barbell, 1H = Dumbbell). 3. If 1H Arm Cast is very weak, 1H Shield Cast is expected to be even weaker. ---> 1H Arm Cast before 1H Shield Cast. ---> Progression should be in the general direction of 2H Arm Cast (easiest) to 1H Shield Cast (hardest). To keep the volume high for each exercise and therefore maximizing time spent on the most productive exercises. As mentioned before, it is simply a Side Circle, therefore we won't spend too much time on the lower levels on progressing it. As you practice Side Swing and Side Pendulum for the Mill, you are already practicing it for the Hammer Swing. The only other movement to practice is the 2H Torch Press, which is not as hard at the same weight as the Swipe or Mill. Arm Casts are harder than Torch Press so Arm Casts would take priority to develop than Torch Press. 1. To maximize the utility of only ONE Clubbell, because the price of 1 heavier Clubbell is cheaper than the price of two lighter Clubbells, and you may not have two Clubbells of the same weight in your facility. 2. You could start with Double Swings/Pendulums, but having two Clubbells at the start though it is harder for the lower body for Double Swings/Pendulums, does not make good utility as that would be the only exercise you would use it for, whereas the focus of the program is the Casts, which you would not be doing Doubles any time soon. The additional Clubbell would be lying on the floor most of the time instead of swung. ---> Therefore all levels are using only one Clubbell until the highest level, ie Phase 2 Level 4. Even then, Double movement is only one third of the number of exercises, therefore i found it good to focus on the utility of a single Clubbell. Just like how one would focus on the utility of a single kettlebell before moving to double kettlebell exercises. As a person who lives in an apartment and who doesn't own personal vehicle, portability is a very important issue. Training at home is possible but not ideal, so training outdoors is assumed at least some of the time. Especially overhead swinging exercises. Training outdoors means you'd have to hand carry your equipment at least some of the time. Even if you have a vehicle, you have to unload your stuff and bring it to your training area. Carrying two Clubbells is NOT FUN, regardless of their weight. You'd have to use two hands to hold on to the Clubbells. Carrying one heavier Clubbell is more feasible, assuming you have additional gear to lug around, eg a bag of personal belongings or other equipment. One hand can be used to hold on to the Clubbell, the other hand can be used to carry your other things. If you can do all your exercises with just one Clubbell, that is good utility to me. If your program specifies Double and Single Clubbell exercises, that is not good utility to me, as some of the time one Clubbell is not being used. Hope you enjoy these progressions. Great article, thanks for sharing your knowledge and conclusions coach Chauw, it's very helpfull for me. 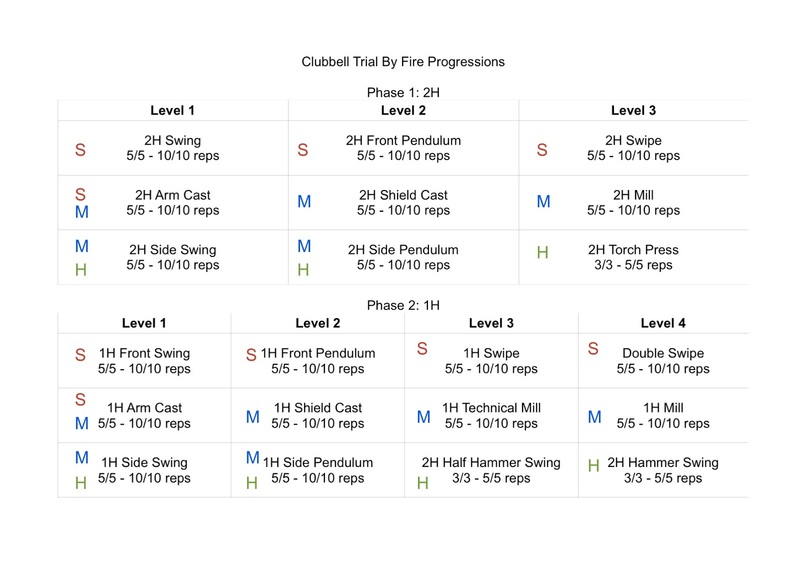 One question, on the first workout of the phase 1 level 1 should I do 2H front swing 5/5, and keep doing just the 2H front swing each workout till I can do 10 sets of 10 reps and then move to the arm cast an repeat the process of adding 1 rep and 1 set per workout; or should I do 5/5 of 2H front swing, 5/5 of 2H arm cast and 5/5 of 2H side swing and then on workout 2 I would do 6/6 of 2H front swing, 6/6 of 2H arm cast and 6/6 of 2H side swing, etc. I hope I made sense coach, sorry for the long question, couldn't find a shorter way to ask it what I wanted to ask. :) Thanks in advance and have a nice day! "5/5 of 2H front swing, 5/5 of 2H arm cast and 5/5 of 2H side swing and then on workout 2 I would do 6/6 of 2H front swing, 6/6 of 2H arm cast and 6/6 of 2H side swing, etc."